Free shipping to United States with $50 purchase from LemonArtStudio. See item details below for sale terms. 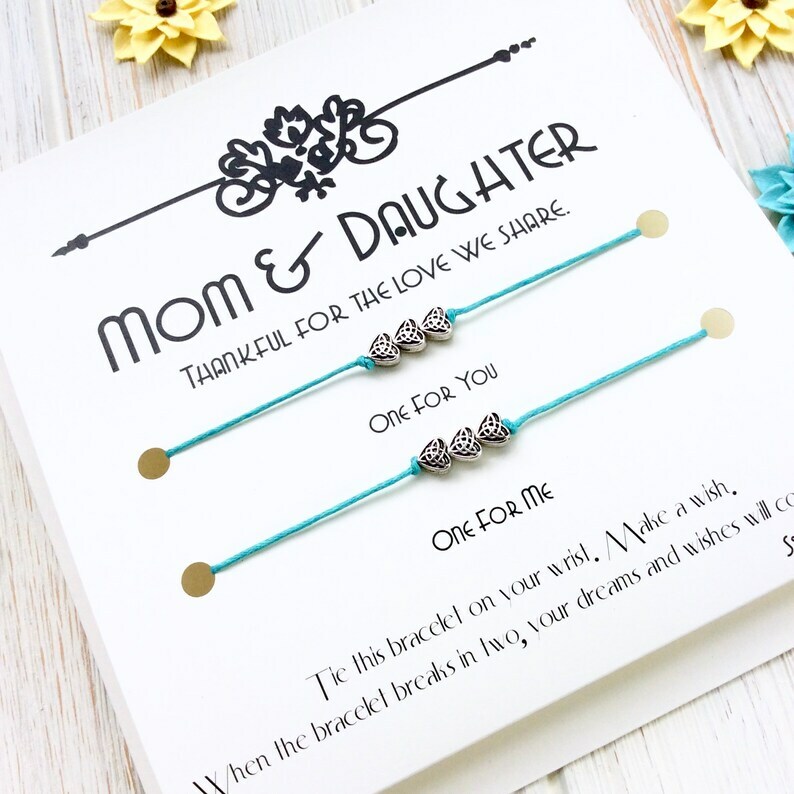 Mother and Daughter Wish Bracelets on a cream or kraft card, with antiqued silver plated flowers or infinity Hearts on a lightly waxed cotton string. Choose 2 or 3 bracelet cards. This is a lovely way to let your mom or daughter know how much they are appreciated. This card works from mom to daughter, or from daughter to mom. The Card is a lovely sentiment for birthdays, a wonderful Mothers Day gift, Valentine's Day, or just an any day surprise. No need to wait for a special occasion...they are special on every day of the year! Ideal gift topper, and can serve as a card and gift in one package. The default 3 bracelet card is shown with One for: You/Me/Me If you would like You/You/Me then please let me know in the NOTES to seller at checkout! Made with quality cotton string cord which is long enough to fit any size wrist. Wish Bracelets are a local custom in South America. Folklore says that a friend or relative tie the bracelet on your wrist, and you can make a wish at the same time. The bracelet remains on your wrist until it breaks naturally, then your wish will come true! 21 cord color options available. Kraft card is shown in White. 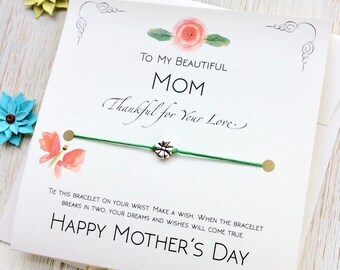 Listing is for one Mother Daughter Card in a cream or kraft card, with 2 or 3 charm bracelets per card. Comes complete with a matching envelope, and envelope seal ready to gift. Free shipping on orders over $50 for a limited time. Very beautiful concept. We love it. Such cute bracelets! My daughter was so excited to having a matching bracelet with me. The bracelets are long enough to fit any size wrist.